The Sallie Harrison Chapter has a long history of supporting both active military and veterans in and around Seminole County. During World War l, Daughters generously contributed to the aspirin fund, bought war bonds and knitted and rolled bandages. They joined the American Red Cross and the USO. The DAR Project Patriot committee was formed following the events of September 11, 2001. Project Patriot was activated as a special committee to organize and coordinated DAR support for those currently serving our country. The chapter has continued to support our active military by contributing funds and items needed by local and NSDAR military contacts. The DAR has been interested in and supportive of veterans since its inception. The DAR Service for Veterans Committee works to find new and better ways to serve our veterans. Our chapter actively supports Homeless Women Veterans, Paws for Patriots and the Haley House Fund, which helps current duty injured and veterans who need their families nearby during recovery from illness and injury. Each year, the Sallie Harrison Chapter's Flags of the USA Committee donates flags to schools in Seminole County to replace those classroom and outdoor flags that have been damaged or lost. 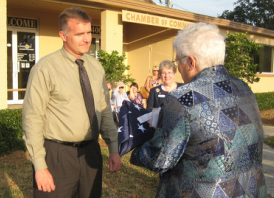 Sallie Harrison Daughters regularly participate in flag presentations. The DAR Project Patriot Committee is the official DAR committee that supports America's active military. Learn more about our local partnerships with K.I.S.S. and the USO of Central Florida. Learn more about our participation in local stand down events and Paws for Patriots, through the work of the DAR Service for Veterans Committee. Find out when our next commemorative event will be held.